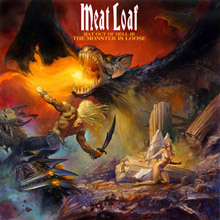 One of the great rock figures of his time, Meat Loaf is forever associated with the terrific Bat Out of Hell album trilogy and for bringing a sense of over the top theatricality to the medium, transforming arenas into almost intimate settings with the sheer force of his personality and his undoubted ability to carry both a song and a story. His album sales are prodigious: the initial Bat album has shifted a phenomenal plus 40 million amount but it was his second part of the tale Bat Out of Hell II: Back into Hell which garnered his Grammy for Best Solo Rock Vocal Performance for the track 'I'd Do Anything for Love (But I Won't Do That)'. His subsequent sales have ensured he remains one of the best selling artists of all time - 100 million and rising - and his standing is particularly high in European markets, especially in the UK where me is something an adopted national treasure. A man with many strings to his formidable bow, Meat Loaf began his career as an actor and has appeared in plenty of well regarded movies (The Rocky Horror Show and sequel The Rocky Horror Picture Show, and David Fincher's Fight Club, for example) staged musicals, and sundry TV shows. Possessor of an awesome set of pipes he has also collaborated with the likes of Brian May, Steve Vai and Ted Nugent - his most fruitful partner being the writer Jim Steinman. The two men have reignited their working relationship in recent months and are planning a future album. Born Marvin Lee Aday in 1947 in Dallas, Texas (his autobiography To Hell and Back documents his early struggles) he actually saw President John F. Kennedy arrive at the local airport on the day of his assassination. Moving to California to pursue a life in rock and roll he achieved some success in the groups Meat Loaf Soul and Floating Circus; they opened variously for Janis Joplin, The Who and The Grateful Dead before Marvin/Meat Loaf took up a role in the musical Hairwhere he teamed up with Shaun 'Stoney' Murphy who became his female foil for a while. Returning to theatre he met Steinman who encouraged both his musical aspirations and his straight acting sideline. Having worked over the tracks on what became Bat Out of Hell for five years the project was finally to see daylight when producer Todd Rundgren assembled a definitive running order in 1977. The rest was history, or would have been except Meat Loaf and Steinman had a rift and his career truly picked up again in 1981 with Dead Ringer. Our story picks him up on the eve of Bat Out of Hell II: Back into Hell (1993). Reunited with Steinman the pair overcame initial knock backs and made a monster that took their initial operatic and cinematic style to its zenith. Doubters are damned since reviews were good and while many missed the inherent humour of the grandiose performances audiences and record buyers did not. Number one-chart placements in the UK, the US and Australia confirmed the formula was not in fact broke. Reconsider if you will the strength of the epic cuts like 'Objects in the Rear View Mirror May Appear Closer than They Are', 'Life is a Lemon' and 'I Want My Money Back' and the seemingly autobiographical 'Rock and Roll Dreams Come Through' (the video for the latter features a young Angelina Jolie) - all topped off of course with 'I'd Do Anything for Love'. The Wagnerian sonics of that classic were followed by Welcome to the Neighbourhood which is again stuffed with Meat Loaf standards like 'I'd Lie for You (And That's the Truth)' - a duet with his studio and live partner Patti Russo - 'Runnin' for the Red Light (I Gotta Life)' and 'Not a Dry Eye in the House'. Writing with Steinman and the hit machine Diane Warren, Meal Loaf surpassed expectations here and upped the hard rock ante with appearances from Steve Van Zandt and Sammy Hagar. Amongst the set piece classics you'll also find a lovely version of Tom Waits' 'Martha' and a poignant take on 'Where Angels Sing'. The Pulp Fiction detective styled cover art and the general breath of material here ensure this remains an albums that is greater than the sum of its parts. It shouldn't be overlooked. A further period of uncertainty arrived when Meat Loaf collapsed on stage in London but his recovery added to his status as the kind of man who won't lie down, no matter the odds - an image which has served him well personally and professionally. 2004's Bat Out Of Hell Live: With the Melbourne Symphony Orchestra was a culmination of that dogged spirit. He is vindicated on 'You Took the Words Right out of My Mouth (Hot Summer Night)', the signature piece 'Two Out of Three Ain't Bad', and an eleven-minute assault on 'Paradise' by the Dashboard Light, which manages to match, and may even surpass the original. And so to the third studio BOOH member of the family - The Monster is Loose. This 2006 set features even more great Steinman compositions and some stellar duets. Russo comes to the party with gusto for 'What About Love?' Jennifer Hudson adorns 'The Future Ain't What It Used To Be' and Norwegian chanteuse Marion Raven joins Mr Loaf on 'It's All Coming Back to Me Now', inspired by Wuthering Heights. Dark and lovely stuff. 3 Bats Live (2007) is the perfect accompaniment to the above being a music DVD of considerable heft and containing a sizeable selection of hits. Captured in London, Ontario during his Seize The Night tour the performance closes with a splendid take on The Rolling Stones song 'Gimme Shelter' where Meat Loaf shows us some of his older blues rock roots. We're proud to bring our Meat Loaf catalogue towards conclusion with Hang Cool Teddy Bear. Produced by Rob Cavallo (the Green Day man behind American Idiot also helped sequence the new concept), this is a thoroughly modern affair featuring songs written by Justin Hawkins from The Darkness, Jon Bon Jovi and old partner Desmond Child. Also, amongst a plethora of welcome guests you'll find Hugh Laurie playing piano, Hawkins on guitar and vocals, Brian May and Steve Vai on axes and the esteemed Jack Black crops up on 'Like A Rose'. 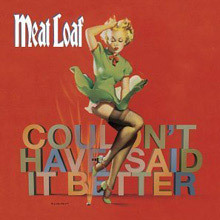 By now most people should have got the picture since this album bursts with delicious wit, crafted songs lovingly constructed and delivered and the kind of madhouse operatic cabaret for which Meat Loaf is not just the originator but also one of the only artists capable of carrying off the conceit with such aplomb. The world is a richer place thanks to Meat Loaf's musical endeavours. You couldn't make him up. He remains a true original with an ambition that dwarfs lesser mortals. Praise be to the Loaf and his ever so much larger than life career. He's got the Meat and the motion. And like he says on 3 Bats Live - if it ain't broke, break it. That's the spirit. 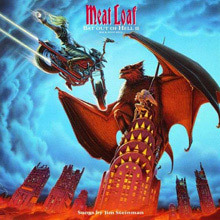 Although Meat Loaf has made several albums since Bat Out of Hell, Bat Out of Hell II: Back Into Hell is an explicit sequel to that milestone of '70s pop culture. Reprising the formula of the original nearly to the letter, Back Into Hell is bombastic and has too much detail, thanks to the pseudo-operatic splendor of Jim Steinman's grandly cinematic songs. From the arrangements to the lengths of the tracks, everything on the album is overstated; even the album version of the hit single, "I Would Do Anything for Love (But I Won't Do That)," is 12 minutes long. Yet that's precisely the point of this album, and is also why it works so well. No other rock & roller besides Meat Loaf could pull off the humor and theatricality of Back Into Hell and make it seem real. In that sense, it's a worthy successor to the original. Released in 2006 Bat Out Of Hell 3 – Monster Is Loose was the third and final part of the ‘Bat’ trilogy. 29 years after Bat Out Of Hell and 13 years after Bat Out of Hell ll. Produced by Desmond Child it is the only Bat album not involving Jim Steinman in its production. Despite this the album does include seven of his songs. ‘The Monster Is Loose’ opens the album featuring ex-Marylyn Manson guitarist John 5, the Steinman penned ‘It’s All Coming Back To Me Now’ and ‘Bad For Good’ with Brian May on guitar plus the Diane Warren written ‘Cry Over Me’ are other highlights. Meat Loaf's unique franchise proving it still had legs well into the 21st Century. 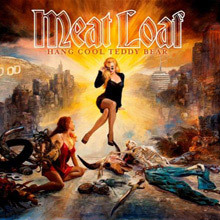 Hang Cool Teddy Bear is the 11th studio album by Meat Loaf and was released in 2010. Produced by Green Day producer Rob Cavallo it has an array of varied and special guests including Brian May, Steve Vai, Patti Russo, Hugh Laurie, Jack Black and Pearl ADay. Highlights include the single ‘Los Angeloser’ and the Desmond Child, Billy Falcon and Jon Bon Jovi composition ‘Elvis In Vegas’. 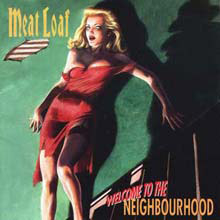 Full of uptempo stirring songs Meat Loaf proves with this album he can still rock with the best. The follow up to Bat Out Out Hell II, this concept album is based on the detective novels of the 50s. It features three classic Diane Warren power ballads who takes over main songwriting duties from Jim Steinman. ‘I’d Lie For You ‘And That’s The Truth’, ‘Not A Dry Eye In The House’ and ‘If This Is The Last Kiss (Make It The Last)’ and all three see Meat Loaf in familiar territory but still on top form. A surprise and welcome inclusion is a version of the Tom Waits song ‘Martha’. Welcome to the Neighbourhood is up there with his best work and demonstrates the consistently high quality of his unique vocals. The eight years since Meat Loaf's last studio album didn't include any editions of his Bat Out of Hell series, but with a live album and a VH1 Storytellers appearance that relied heavily on Bat material, it sure seemed like it. Maybe that's why Couldn't Have Said It Better feels like the more sure and energetic post-Bat albums (Dead Ringer and Welcome to the Neighborhood) with the singer still sounding ecstatic from hitting a home run. Performance wise, Meat Loaf is in fine form, rocking it out bar-band style and able to deliver the grandiose tongue-in-cheek lyrics with just enough smirk. The material gets divided into two "chapters," splitting the songs into Bat-like mini-operas on the first and turning the bombast down to mere Queen level on the second. Motley Crewe's Nikki Sixx and his writing partner James Michael contribute the bulk of the first chapter, with songs that betray taste and come right from the hulking Jim Steinman school. Just the right amount of camp keeps the rocking title track in check and Meat's call and response duet with Pearl Aday on "Man of Steel" stands with his finest moments. Chapter two kicks off with the great "Testify," a shimmy of a rave-up worthy of Meat's Eddie character from The Rocky Horror Picture Show. It was a brilliant move to hire Hedwig and the Angry Inch's composer/lyricist Stephen Trask for the husky "Tear Me Down," and Diane Warren contributes the softer "You're Right, I Was Wrong." The hyper and silly rap on "Do It" is ludicrous even by Meat Loaf's standards, but a chugging version of Dylan's "Forever Young" and the fiery version of "Mercury Blues," hidden as a bonus track, make for a perfect ending. 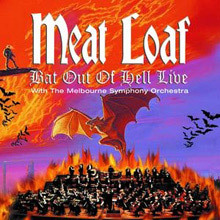 The 2004 release Bat Out of Hell: Live With the Melbourne Symphony Orchestra is pretty much what the title claims it is -- a live version of Meat Loaf's classic album, performed in its entirety, right down to the dialogue spoken between songs.